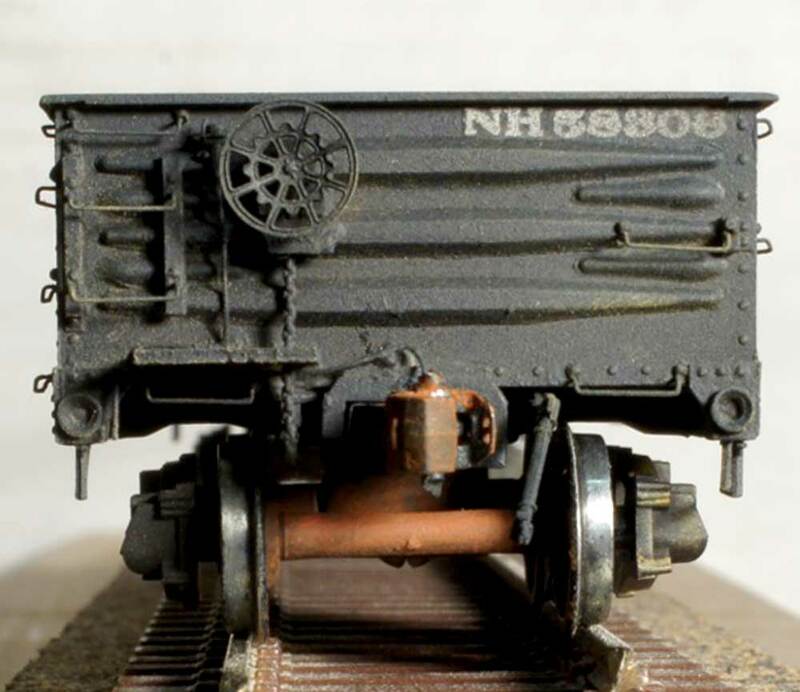 Fellow Pre-Depression Era modeler Dave Parker has sent notes on a recent resin freight car kit build. Click on any image here to review a larger size. Here’s Dave’s story. In 1929, the New York, New Haven and Hartford received 500 class GA-2 gondolas from the Pressed Steel Car Company. These all-steel, drop-bottom gons had an inside length of 40 feet, and were numbered in the 58000-58499 series. Based on my collection of Official Registers, 496 remained in service as of 1945, but by 1955 this number had dwindled to 276 cars, and all had been rebuilt as solid-floor cars (GB classification). At some intermediate date, probably about 1950, the 58000 series apparently contained a mix of original and rebuilt cars, but I do not own an ORER that gives the exact numbers. About three years ago, I purchased the corresponding HO scale Funaro & Camerlengo kit # 8240. At that stage of my modeling career, I tended to purchase kits based primarily on compatibility with my 1934-35 modeling era and on the likelihood of appearance on the Boston & Maine (which interchanged extensively with the NH). These days, I try to do a bit more research into the prototype’s history before buying. In contrast with many other resin kits (including some from F&C), this one contained a notable absence of prototype information. The summary above is about all I know about these cars. I completed the construction shortly after purchase. This was, I think, the third resin kit that I completed, and it’s been sitting on the shelf while I worked up the nerve to weather it. I recently changed the trucks (see below). I built the kit mostly according to the instructions. Overall, it has a decent one-piece body casting. Even back then, I had started using BLMA 0.008-inch scale grab irons and I haven’t deviated from that since. The model came with Tichy Train Group KC brake system hardware and vague instructions as to how to split it into KD to install the separate reservoir and cylinder. I used a Tichy KD set instead, and was able to suss out what I think is the correct arrangement based on other models. The kit called for uncoupler rods and I installed those. It did not come with air hoses, so I added some from Cal-Scale, part 276. The couplers are “semi-scale” Kadee #58 with the trip pin cut off but housed in standard #5 boxes. If I were it to do over, I would have used Kadee 178 semi-scale draft-gear boxes, as I had to provide my own anyway. I painted the car using Polly Scale Steam Era Black and used the F&C decals provided. In hindsight, I might have opted for the equivalent Speedwitch Media set (D132), as F&C often seems to have size problems, especially with the 2-inch lettering. In their defense, the New Haven prototype photos that I have are not always 100% in accord with the 1927 ARA lettering standards. The F&C decals did not come with repack lettering, which strengthens the case for using the Speedwitch set that does have this detail. Just last year I obtained a builder’s photo for the 58000 series. It persuaded me to put arch bar trucks on the model, although this seemed at odds with the 1929 build date. It is possible that these were second-hand trucks used only for “staging” the photograph and the actual production utilized the cast side-frame trucks that appear in several post-war photos. But, perhaps the NH was merely being parsimonious on the eve of the Depression, and the arch bars were in fact used until their ban from interchange in 1941. To my eye, the best match for NH arch bars are the Kadee model 1561, which come with rib-back wheels. These “self-centering” trucks are a bit of a chore because you have to grind the mounting post flat on the bolster and then tap for 2-56 screws. For weathering, I applied a flat coat, oversprayed with grimy black. Tamiya “pastes” (equivalent to Pan Pastels) were applied and a touch of AIM powders, followed by a final flat coat. Rust on the trucks and underframe was done mostly with acrylics. One of my Tamiya sets includes metallic silver and rust, so I used these to add “flecks” where the paint would have chipped inside the car. I am not sure I am 100% happy with the result. The residual coal in the corners is a hat-tip to Ray Breyer and was affixed with the ever-versatile Pledge/Future floor finish. Once the model was finished, I had a classic palm-forehead moment when I remembered the builder’s photo: the monogram was “NYNH&H”, not “NEW HAVEN”. In my defense, the decal set did not offer the former option, nor does the Speedwitch set. I came really close to stripping the decal and redoing it with dry-transfers. But then I came across a builder’s photo of a class GS car (50000 series), dated August, 1930, with the NEW HAVEN monogram. Al Westerfield has opined that the switch came in 1936-37, but I have not seen much photographic evidence one way or the other. So, I decided that 1935 was part of a “transition period”, and am sticking with NEW HAVEN (for now). A final issue arose only when, based on my photo of the car deck, Eric Hansmann commented that it looks like the drop door hatches have been plated over. Indeed it does, and a quick measurement with my calipers agrees: the plates are some 2 to 4 scale inches larger than the corresponding hatches underneath, as well as the dimensioned door openings shown in a diagram in the kit’s instructions. F&C also offers rebuilt (“flat bottom”) versions of this car (nos. 8241, 8243) with a different body casting, but I surmise that the deck provided is intended to be used in both the original and rebuilt versions. So, I may need to only run this car loaded, although this particular flaw requires careful scrutiny to be noticed. Overall, I am reasonably satisfied with the result. The weathering seems about right for about six years of hard use carrying coal and who-knows-what. It certainly was a valuable learning experience, much of it on-the-fly. On to the next project! Many thanks to Dave Parker for sharing his latest freight car experience. I hope he sends along the details on his next project! Feel free to share a comment in the section below. Please follow the instructions so your comment can be posted. All comments are reviewed and approved before they appear. To subscribe to this blog, enter your info for a comment and check the last box to notify of new posts by email. Really nice modeling Dave and I like your backstory. Another gondola model possibility involves the Accurail 40-foot gondola. After I used that kit’s Dreadnaught end to create an Illinois Central GS gon using the Detail Assoc.’s kit, I had a gon with no ends but a set of spare ends from the DA kit—plate steel w/two horizontal braces. This combination matches a group of gondolas owned by the Wheeling & Lake Erie. Thanks Bill. I need to look at those Accurail gons. I’m curious, do you have the dimensions of the Dreadnaught ends that you harvested? I am searching for 4-rib Dreadnaughts that could be adapted to an IM USRA composite gon (~62″ x 116″ scale). The Accurail ends look a bit tall, but it’s hard to judge from photos. Any advice always appreciated. I agree with Paul. I think the weathering is very convincing. Beautiful model Dave! Neatly built, subtle weathering, looks the part. Thanks for taking the time to document and present it to us. Just a wonderful job all the way around. I always enjoy looking at the excellent work show cased in these threads. The knowledge of the prototype is fantastic. My era is a bit after your time to model but there could still be a few of these floating around in the late fifties, maybe in scrap metal service for example. I just have a question regarding the wheels, are they the code 88 size or the larger ones? Thanks for the kind words. Yes, those are code 88 wheels. As far as I know, Kadee now offers all of their trucks with code 88 wheels (prefix 1, as in 1561) as well as with code 110 (561). They also sell the only rib-back wheels of which I am aware; axle length is ~1.018″. Beautiful model, well built and documented. I like the way you treated the trucks; back of wheels and axles rusty, front grimy black, typical for the steam age, pre roller bearing era. Looks great. I have one in progress of the fixed bottom variety. I cut out the floor and rebuilt the underframe with thinner material to leave room for a weight under the floor. I’ll fill in some prototype info for you. According to the New Haven diagram they were built in the New Haven shops. So I’m not sure what’s correct there. The rebuilding program started c1948 (the diagram notes the brake system change on 3-25-48) and they received AB brakes and Miner or Universal handbrakes at that time. The original cars used Ajax handbrakes. Thanks Randy. That helps fill in the gaps in my ORERs, and clarifies the fairly rapid transition from drop to fixed bottom.